Pic Infuriating yet stupidly popular crapp Flappy Bird has officially returned, it appears – and it's now a multi-player game called Flappy Birds Family. It's available for free for Amazon's set-top box, the Android-based Fire TV. According to its app store listing, the software was built by Dotgears Studio, aka Flappy Bird creator Dong Nguyen who works out of Hanoi, Vietnam. He was not available for immediate comment. Nguyen released the original game in May 2013, and eventually netted tens of thousands of dollars a day in ad revenues when the thing became a runaway hit. In February this year, in a shock, shock move, he pulled the crapp from Android and Apple app stores – not that the game was ever really dead: 'droid users could install the game without having to go through an app store, for example. In March, he revealed the highly addictive time-waster would return, and now, today, the world has – just in time for the weekend – Flappy Birds Family unleashed on it. The new person-versus-person mode, playable on your TV via Amazon's box, pits brothers, sisters, parents and friends against each other. It's double the width, double the frustration, and double the time spent avoiding life's crushing responsibilities. "This version is not as addictive as the original, and for that I am thankful!" cried one chap reviewing the software on Amazon.com. "I missed out on all the hoopla the first time around and thus, undoubtedly, had a much more productive summer than most, but now that it's available again, I'll just tell my wife and kids that daddy has to go to the bathroom and not return for three hours," another chimed in, leaving five stars out of five. "I'm sure it'll be fine." 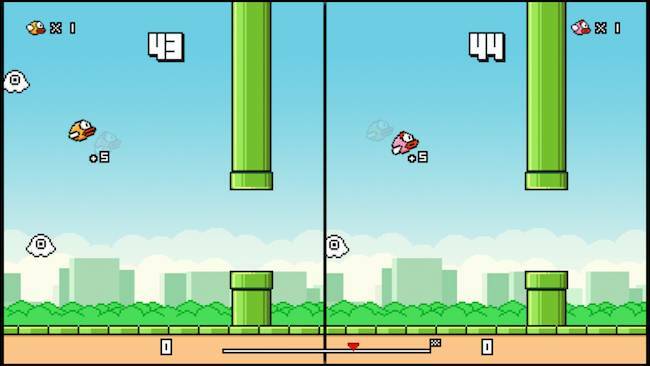 Before you complain, there are plenty of crapp clones of Flappy Bird out there, some with multiplayer options if you don't fancy or can't use this new apparently official release – and, of course, FlapMMO is still a thing.